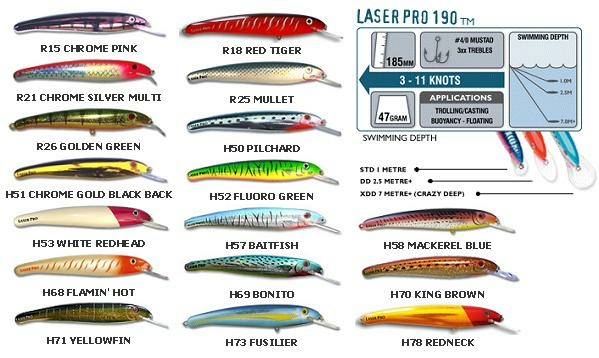 The latest in lure technology incorporating strength, durability and fish catching ability. The outer body has extra secure hook anchoring and towing points that are built in as an integral part of the lure body. Halco’s Bullet proof bib securing system provides added strength and ensures faultless swiming performance at high and low speeds. Now widely recognised as one of the world’s best bluewater trolling lures, this 47 gram lure can be trolled over a wide speed band, however its optimum speed for trolling for pelagics is around 6.5 knots. Troll lures at distances ranging from 10 to 50 metres from the boat. About 25 metres is normal. Troll more than one lure at once to increase your chances and emulate a school of fish.